On June 15, a Houston jury convicted Arthur Andersen — the 89-year-old accounting firm once known as the gold standard of integrity in auditing — for obstruction of justice in the government’s investigation of Enron, Andersen’s biggest client. With the demise of Andersen, the American business landscape was forever altered. But something else was altered as well: the scandal surrounding Enron and Andersen, together with the wave of other major accounting scandals that have come to light in recent months, has dealt America’s markets an unsettling psychological blow. If we can’t trust the auditors, investors wonder, whom can we trust? The meteoric rise and stunning collapse of Enron caused many to question why the corporate oversight system that was supposed to protect investors failed to sound any alarms about the company’s dubious finances. But Enron and Arthur Andersen turn out to be merely the tip of the iceberg. In the 1990s, more than 700 U.S. companies were forced to correct misleading financial statements as a result of accounting failures, lapses, or outright fraud. Together with Enron — the largest corporate bankruptcy in U.S. history — these failures have cost investors an estimated $200 billion. What went wrong? In “Bigger Than Enron,” FRONTLINE correspondent Hedrick Smith shines a spotlight on how the corporate watchdogs — the bankers, lawyers, regulators, politicians, and above all, the accountants — failed to prevent Enron and other scandals from happening. Through interviews with current and former SEC officials (including SEC Chairman Harvey Pitt and his predecessor, Arthur Levitt), Arthur Andersen executives (including former Andersen CEO Joseph Berardino), members of Congress (including Sen. Joseph Lieberman of Connecticut), investor advocates, and others, the report explores how the system of controls was eroded by conflicts of interest, as well as by congressional intervention that blocked efforts at protecting investors. “The trail leads to Washington,” Smith reports, “where Congress weakened the protections and tied the hands of regulators, making it easier for aggressive companies like Enron to push the envelope.” During the past decade, the accounting industry has flexed its lobbying muscle on Capitol Hill as never before, and Smith examines the three major political battles of the decade’s accounting wars: the fight over stock options, the fight over tort reform, and the all-out war over SEC Chairman Arthur Levitt’s attempt to rein in conflicts of interest by forcing accounting firms to separate their auditing and consulting practices. But ultimately, as this report shows, it was not just Congress but the big accounting firms themselves that failed to protect investors, and what happened at Arthur Andersen illustrates the wider story of how the oversight system broke down. 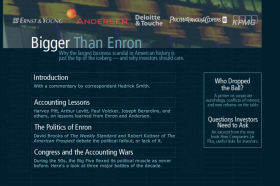 “Bigger Than Enron” examines three specific cases in which Andersen auditors allowed misleading or fraudulent accounting practices to cause enormous investor losses — at Sunbeam, Waste Management, and finally Enron. In the late 1990s, Sunbeam CEO Al Dunlap used simple accounting tricks to paint a picture of a turnaround in earnings that didn’t exist. With a pay package that included more than seven million shares and options, Dunlap stood to make more than $200 million personally if he could keep Sunbeam’s stock price flying. In the spring of 1998, when Dunlap and his team ran out of tricks, Sunbeam corrected its books, declared bankruptcy, and the stock price plunged from $53 at its peak to just pennies today. In an ominous harbinger of the Enron scandal, the SEC discovered that Andersen accounting documents had been destroyed. In the case of Waste Management — which in 1998 issued the largest corporate restatement before Enron — the company had exaggerated its earnings by $1.7 billion. The SEC’s investigation found a longrunning cover-up — not just by Waste Management, but by Andersen as well. Andersen and Waste Management paid a steep price in stockholder settlements, but no one went to jail. The SEC fined Andersen $7 million in June 2001, and Andersen promised to shore up its internal oversight — but by then they were already deeply enmeshed in new trouble at Enron.